Lee Rayner is going to share a few secrets around kingfish including, gear, rigging, sounding, the fight and preparation for the table of these pound for pound brutes! Tickets are $10, kids under 18 are free & raffle prizes are off the hook! 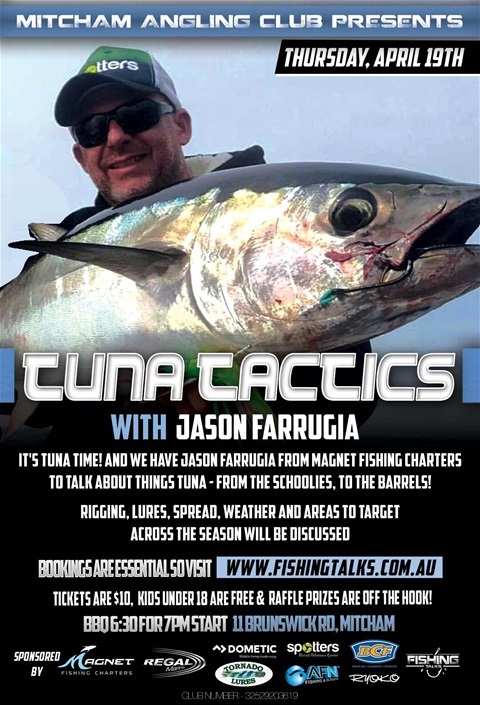 Places are limited so head to www.fishingtalks.com.au to secure your spot! Don't forget we are on for an epic talk nite with Eisuke Kawakami, AKA Mr Yamashita! BBQ from 630, talk from 700. Club will be open from 530ish. Jig specials on nite, a good raffle pot along with info overload! Head over to www.fishingtalks.com.au to register! As usual, information provided will be like getting smoked on a locked up drag ! Lukes crossing the ditch fomr NZ to provide oversight on all things Swords! Our next talk night is on Friday 17th November and wil be on all things cod with Mick Caulfield and John Cahill...boy will it be a cracker! These blokes frequently score metre plus fish and are happy to share a thing or few to help you land an iconic beast. BBQ prior, massive raffle pot on offer and a ton of info to go away with. Oh and kids are free! Head over to www.fishingtalks.com.au to book in your seat today! It’s that time of year where the seasonal run of snapper appear in our bays, so we thought we best host a talk night on all things Snapper! 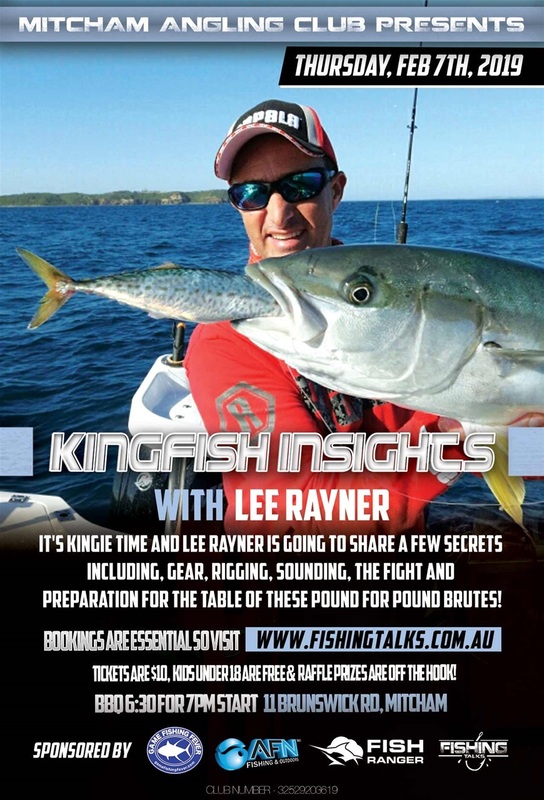 And who better to provide insight than Think Big Charters skipper Shaun Furtiere. Shauns wealth of knowledge will see those in attendance go away with new found tips and tricks to aid your chances of landing more fish, and better quality fish more often. No cost for members, $10 for general public. If you join on the night or pior, it is also no charge. And kids under 18, FREE! BBQ provided prior with drinks at bar prices and a good raffle pot on offer, including a charter pass with Think Big! Head over to www.fishingtalks.com.au to secure your seat today as places are limited! 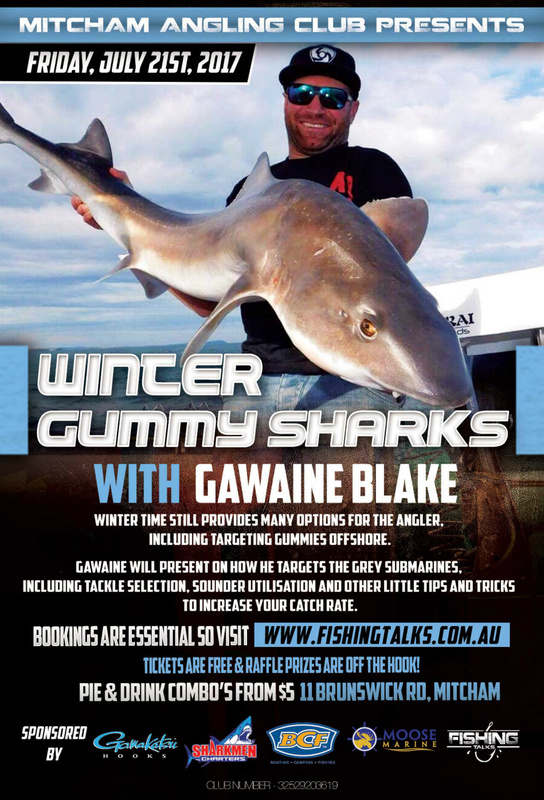 Gawaine is back again and this time it is all about the winter gummy shark fishing. Plenty on offer raffle prize wize including a 4 hour guide. Pie and pot $10, pie and softie for a $5er. Doors open from 5, with talk to commence from 7. Note- as of 25/6/17 over 60 seats have been taken. Come along to Mitcham Angling Club and hear Paul Carter present on all things Squid. 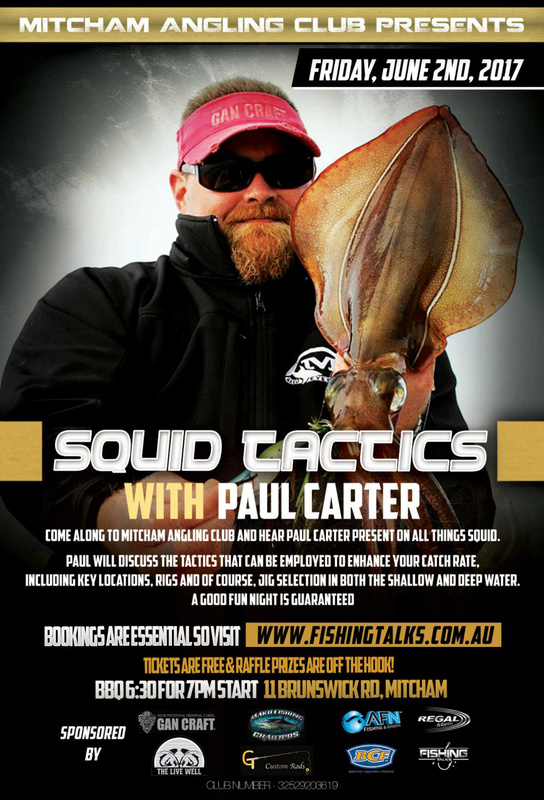 Paul will discuss the tactics that can be employed to enhance your catch rate, including key locations, rigs and of course, jig selection in both the shallow and deep water. Entry for the talk is free. To mix things up a bit this time we are running a pie and drink option for purchase. Cost for a chunky steak pie, pot and door prize ticket is $10 for non members and $5 for members. Persons under 18 will be $5 with a pie, soft drink and door prize ticket. There will be a few door prizes for both the adults and under 18s on offer so please don’t be shy in bringing the kids along for what will be a really informative and family fun night! Please advise for catering purposes if you are looking to purchase a pie and drink combo by selecting the appropriate option. Payment will be upon entry. GET PUMPED FOR THIS ONE! This is the 6th of our Stronger Fishing clubs talks hosted by the Mitcham Angling Club which sees Gawaine Blake and John Cahill discuss how to successfully target what is considered a prize catch in Victorian waters. Entry is free but seats are limited. 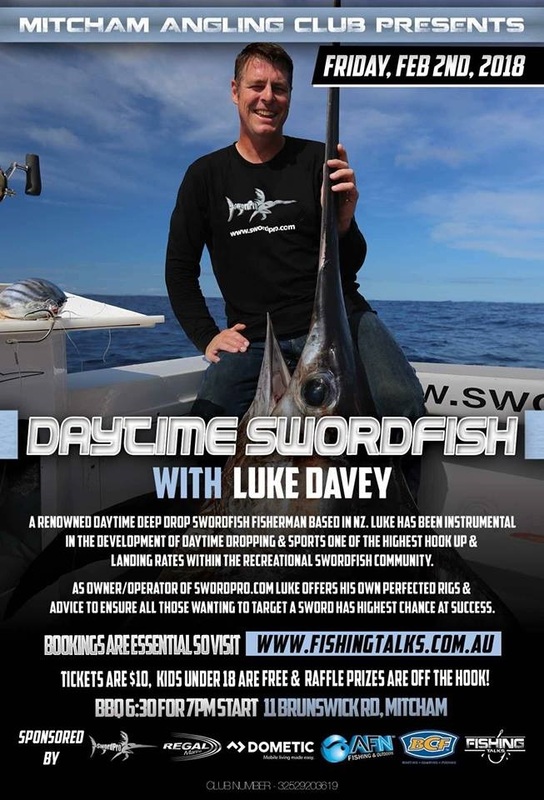 Please head to www.fishingtalks.com.au to secure your seat. A big thanks to those sponsoring the night as we've got $1500 in prizes on offer for our major raffle as well as some door prizes. Details of these will be communicated in the coming weeks. Memberships will be available on the night and if thinking of joining, then best to take advantage of doing so before our joining fee price rise kicks in. A membership also secures you priority entry to our talk nights before the remaining allocation is opened up to the public. 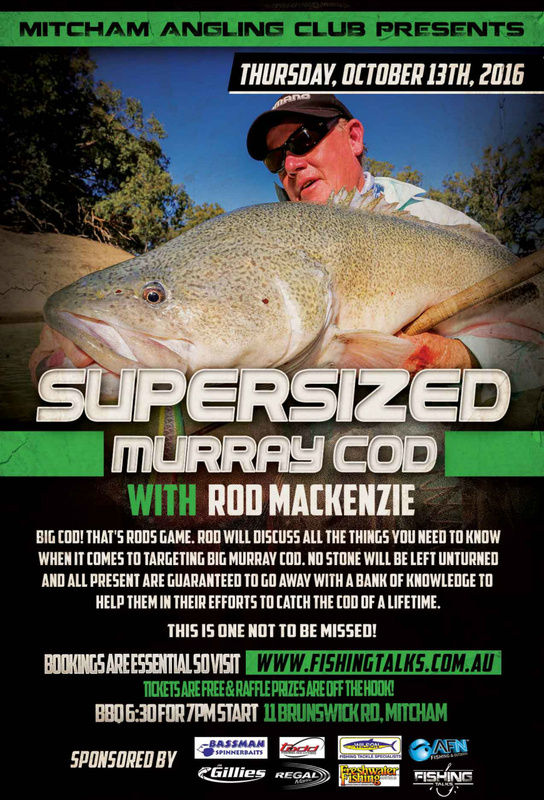 Last years talk sold out so get in early to avoid disappointment! Please also note that our volunteers assisting with putting up the talk website and controlling the MAC social media feeds will not be in a position to respond to any issues between the 18/1/17 and 26/1/17 as they will be over in NZ fishing the 3 Kings - hopefully all is smooth sailing but best we let you know, especially if there are issues in regards to all tickets being secured. 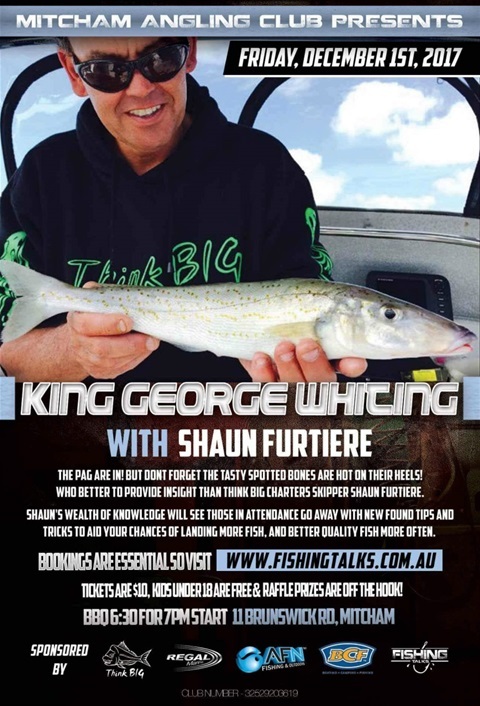 We know many of you love catching whiting so we thought we'd make our 5th talk related to our stronger fishing club grant about it! 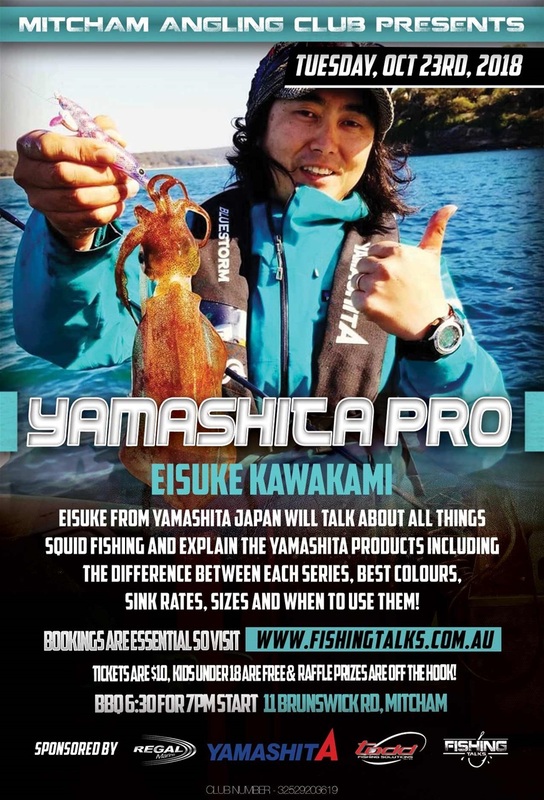 Head over to www.fishingtalks.com.au to secure your seat. BBQ prior, prizes galore and plenty of info to be learnt! 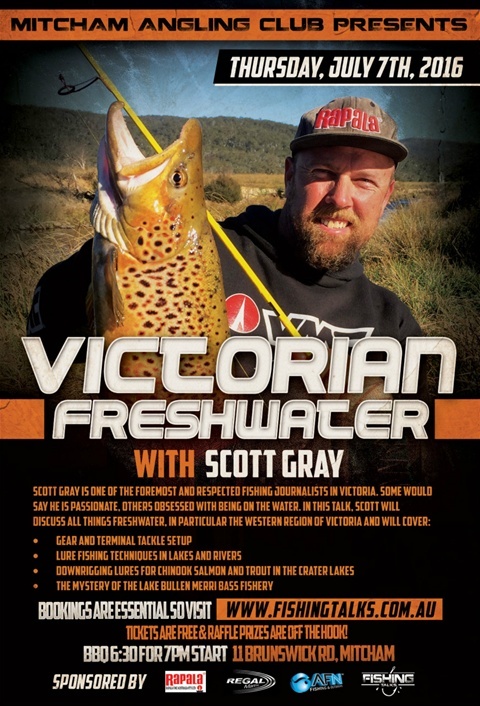 This is the 4th installment of our free special guest fishing seminars being held at the Mitcham Angling club thanks to our Stronger Fsihing club grant. 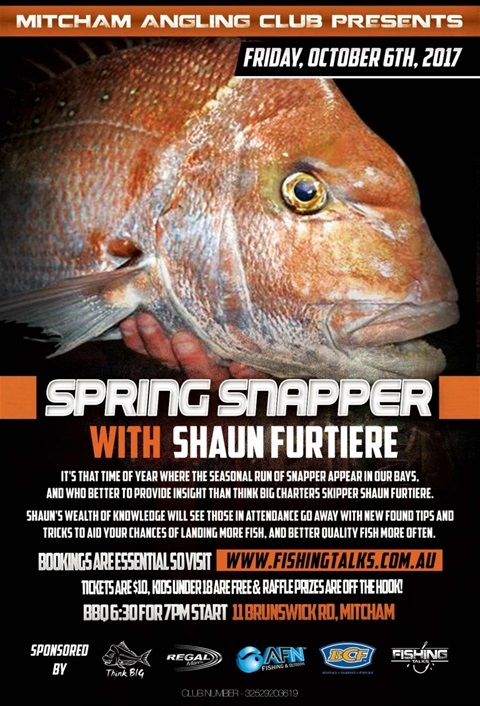 This is the 3rd of our stronger fishing clubs talks. 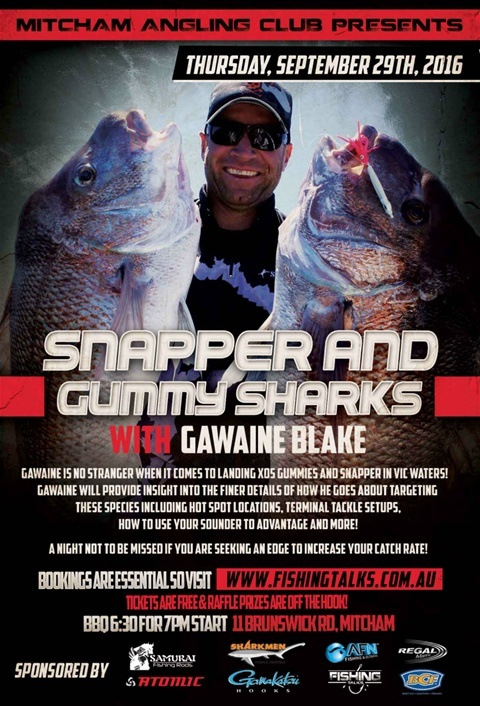 Gawine Blake is our guest and will be discussing all things Snapper and Gummies. BBQ from 630 with talk to start from 700. AND ENTRY IS FREE- BUT YOU NEED TO BOOK! 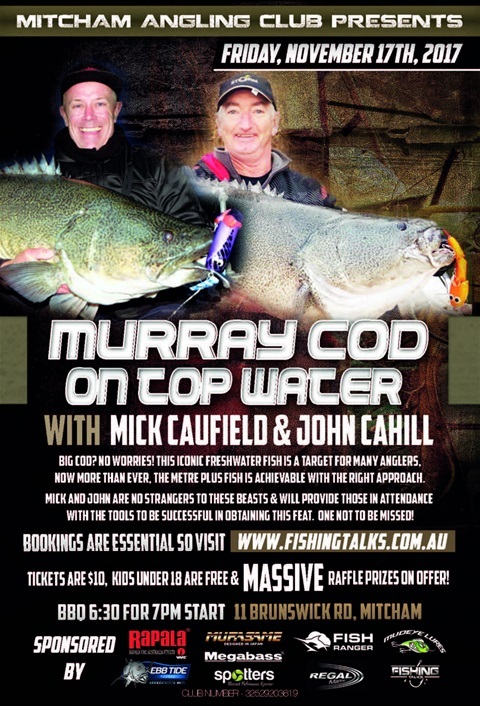 Head to www.fishingtalks.com.au to secure your spot as capacity is limited! We have the following sponsors on board with a door and raffle prize pool of about $1500. 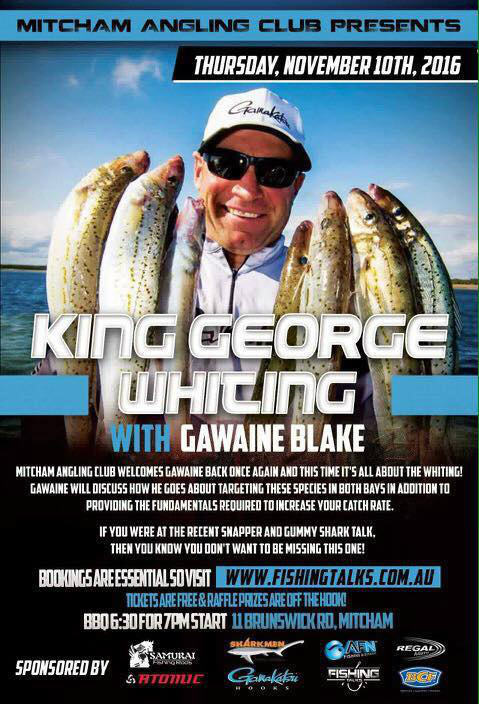 A 4 hour guide with Gawaine will be one of the prizes on offer. A big thanks to all of the above who have come on board to support the night! As part of our stronger fishing clubs grant, we are holding a series of talks between now and early 2017. 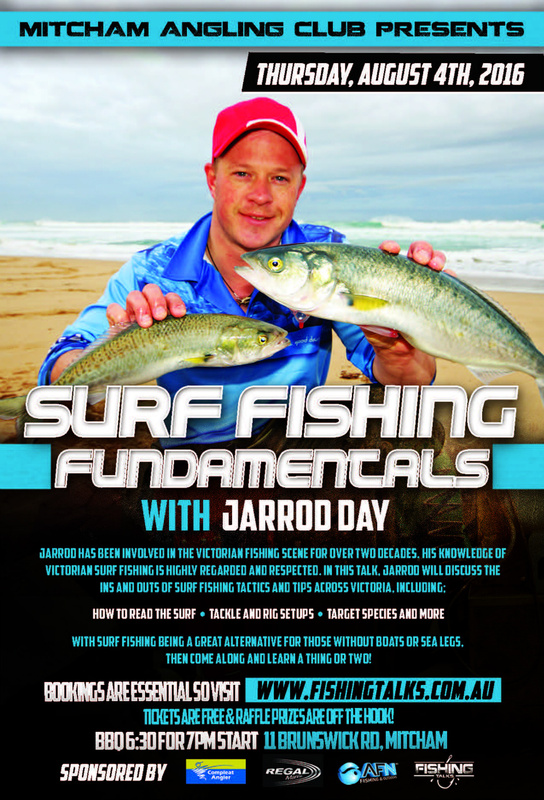 The 2nd one we are having is with well respected fishing journalist Jarrod Day on Thurs 4th August who will talk about all things surf fishing. BBQ served from 6-30 with talk to commence around 7pm. Once again we have some great door and raffle prizes on offer with thanks to our event sponsors! And the best bit is that it is FREE! 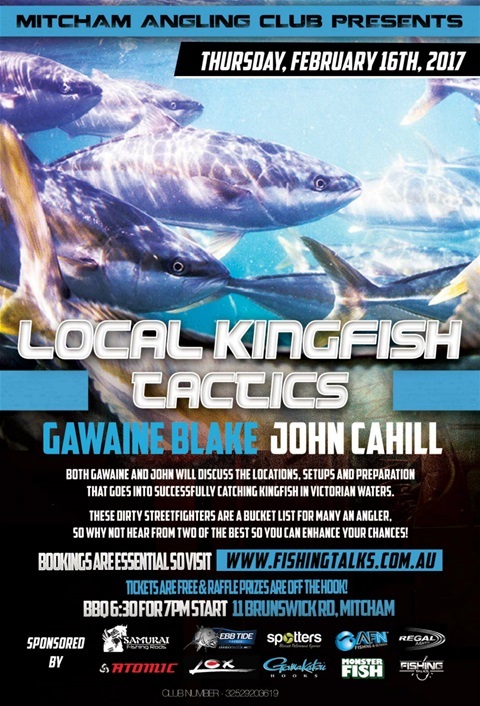 The only catch is we do have a capacity limit so if you wish to come along, then get in quick- head over to www.fishingtalks.com.au to grab your tickets.